How to choose the correct solar storage system and use them correctly? Home ￤ Technical news ￤ How to choose the correct solar storage system and use them correctly? We(Propsolar) designed and sold many solar storage systems(also called solar off grid system),in the world for many years. We found one big problem that customers do not know how to use the solar storage system correctly,some customers may damage the solar system, so it will big loss for customers, we think it is necessary for us to tell customers how to choose and use the solar storage system correctly. Solar storage system is consist of solar panel,inverter,controller and battery. Solar panel can offer the solar energy and charge the battery with controller, Inverter can convert the DC to AC. We found most customers do not know how to choose the correct solar storage system, they may ask "please send us 3KW solar system for my home", but this is not correct way to choose the solar storage system. If one supplier offer this 3KW system solution and offer to you directly without any questions, unfortunately you find the unprofessional supplier. All the solar storage systems should be designed based on the "Loads information" ,such as 1set TV 150W working 8hours/day, we need to have all the loads information to calculate how much energy do you need per day and raining days backup. We also need to have your load's type, such as TV, Air conditioner, we need to understand whether there is any "Inductive loads", with these inductive loads, the start voltage and current will be higher, we need to verify which capacity inverter is fine for the system. For example: if there is 1KW air conditioner, we can not choose the 1KW Inverter for this sytem, we need to choose 4KW/5KW inverter to run this system. One of the most important part for the solar storage system is "Battery". The battery cost is around 40% of the whole system, if you can not use the battery correctly, the battery maybe damaged by you within 1-2 years.The depth of discharge for the Lead Acid battery,Gel battery or Lead Carbon battery is around 70%, but it does not mean you will have 70% depth of discharge everyday. If you do this way, your battery will be damaged within one year.The correct depth of discharge is around 20%-25% per day for the whole system, in this way, you can make the battery with more long life time. 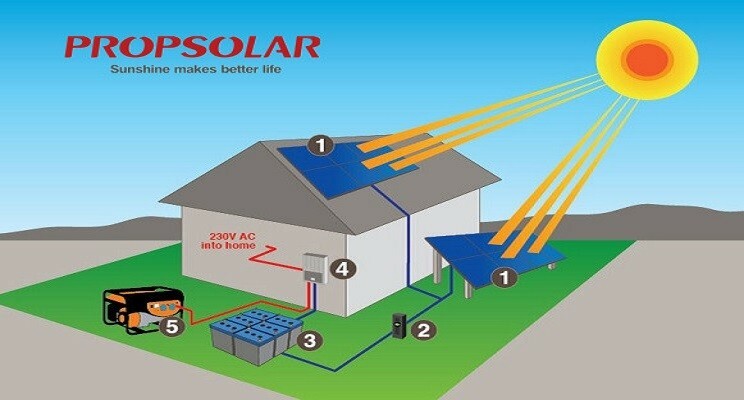 So from the above information,you may understand the solar storage system well,we hope more and more customers understand the solar system and use the system well. Copyright © 2018 Shanghai Propsolar New Energy Co.,Ltd All rights reserved.